We’ve teamed up with BetVictor and Charlie McCann to preview the day’s racing. The ground at the Curragh eased to good to yielding on Friday morning following overnight rain and conditions should be perfect for Mecca’s Angel (5.15) to land her fourth in a row in the Sapphire Stakes later this afternoon. The filly has only had the one start so far this term when easily scoring in Group 3 company at Longchamp back in the spring in a very fast time on ground, arguably, quicker than the official good to soft description. The grey was a late defector at Royal Ascot on account of the rattling fast ground but there should be no excuses with regular pilot Paul Mulrennan in the saddle. She is a confident selection. Epsom Oaks winner Qualify was a big disappointment in the Irish Derby despite taking into account was asked to take on the colts and in the Irish equivalent I am going to take a chance on the unbeaten Words(5.50) another Ballydoyle inmate. The selection has a poor draw in stall ten and has only race on fast ground so further significant rain would be an unknown although her brother Nevis was a dual winner on soft ground. The form of last month’s Group 3 Cork success was a given a boost when the runner up, Carla Bianca, won at Leopardstown on Thursday and at 10/3 with BetVictor she gets the vote. At Newbury, the older horses have won the fillies’ handicap for the last half-a-dozen years but I think that trend will be bucked today as I am looking forward to the second start of Sealife (2.00) who ran away with a Windsor maiden on debut earlier in the month in the manner of a smart sort. It is interesting that trainer William Haggas wastes no time getting her back on the course, only raced 12 days ago, and I think she will get further in time but she is potentially very smart and can fend off Cartier who has been raised 3lbs for finishing third at Newmarket last time. Consort (2.35) was no match for Gleneagles in the St James’s Palace Stakes at Royal Ascot last month fading into third after setting a decent clip under Frankie Dettori. He might be taken on for the lead in today’s Steventon Stakes by Mustadeem and Intilaaq with the latter, not seen since a poor run in the Guineas back in May, an intriguing runner for Roger Varian. That said Consort looked to be crying out for this step up to 10f last time and gets the vote with Dettori again in the plate. Fourteen of the 25 runners in the valuable Sales’ race the Weatherbys Super Sprint are trained by either Richard Hannon or Fahey but my two against the field are Soapy Aitken and Excessable (3.45) with marginal preference for the latter trained by Tim Easterby who saddled the winner three years ago with Body And Soul. A winner at Ripon on debut the selection narrowly failed to give 13lbs - including jockey’s allowance - to the filly Lydia’s Place who has subsequently won a York nursery from a mark of 87. That suggests Excessable should have a leading chance carrying 8st 3lbs today although he only receives 6lbs from Soapy Aitken who is officially rated 99. At Newmarket, Arabian Comet (2.15) can reverse Goodwood form from earlier in the season with Charlie Appleby’s Dream Child although the former’s 11 week-absence from the track is a slight concern. The selection was baulked at a vital time on that occasion and as long as there is enough pace in the race she can take this listed prize. The Summer Plate at Market Rasen really is a treat for jumps fans and Pumped Up Kicks (3.30) gets the each way vote at 7/1 with BetVictor. I am, unashamedly, a massive fan of the training talents of Dan Skelton and his progressive mare Pumped Up Kicks can land the feature. The selection has won her last two starts over the larger obstacles and can maintain her progression despite being 11lbs higher than when scoring at Cheltenham in April. Paul Nicholls’ Valco De Touzaine and Dell’ Arca are big dangers in a terrific renewal of what is one of the highlights of the summer jumping season. At Cartmel, it is interesting that the headgear is left off Buachaill Alainn (3.50) and three of his four career wins have been gained without the visor or cheek-pieces he has worn of late. 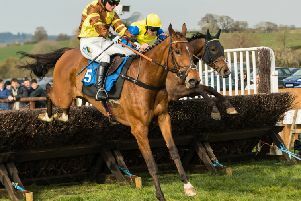 He should also have been freshened up after a nice six-week lay-off and the Peter Bowen yard must still be scratching their heads how Regal Diamond was priced at 6/4 overnight for the Uttoxeter hurdle he won earlier in the week. Vivacissimo (4.25) is 4lbs out of the weights but must go close in a valuable lady riders’ handicap although Irish raider Tempo Mac looks a big danger for Gordon Elliot. For all your racing needs check out BetVictor.com.